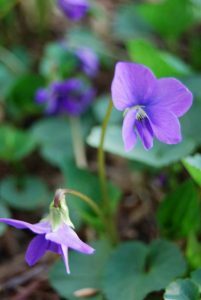 As children, sisters Elizabeth Kuehner Smith, Ellen Kuehner and Robin Adams spent many summers fishing and canoeing at Laurel Lake and picking wildflowers in the woodlands surrounding their grandmother’s house in Laurel Springs, New Jersey. 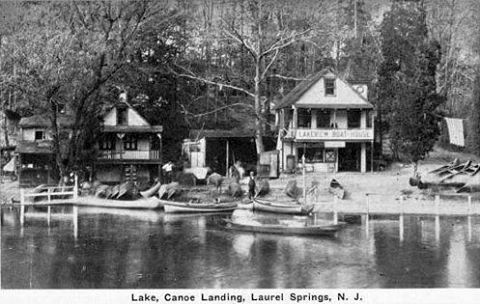 Home to Big Timber Creek, beech trees and serene vistas, Laurel Springs was once a rustic summer resort for Philadelphians seeking relief from the hot city. It was also a summer retreat for celebrated poet Walt Whitman who found solace and poetic inspiration traversing the woods and fields, notebook in hand. Today, Elizabeth and Ellen are leading the effort to preserve their family’s land—aspirationally dubbed “Whitman Woods”—in more than just memory, but forever as a lakefront sanctuary stewarded by North American Land Trust (NALT). It’s a familiar story for many of us. Due to ever-expanding development, we have witnessed the woods and streams we played in as kids consumed by sprawling neighborhoods and shopping centers. “Whitman Woods” is the only remaining undeveloped open space in Laurel Springs, and it is the only natural area remotely resembling the woods Whitman cherished. 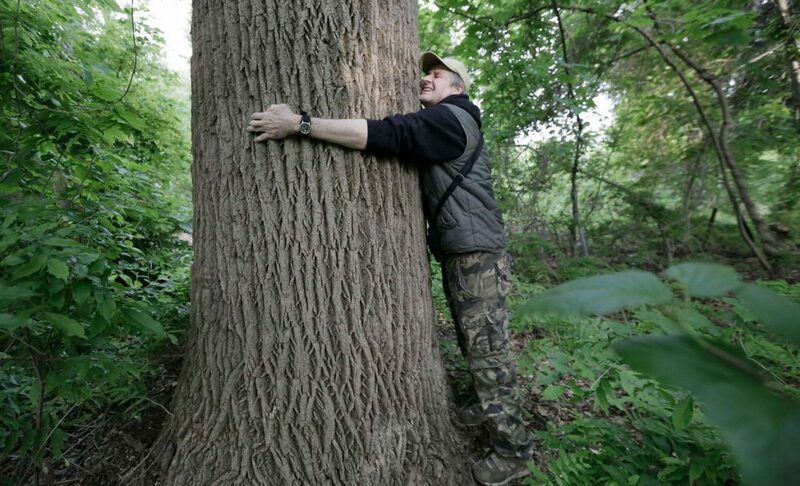 Although “Whitman Woods” is just 3.75 acres, every acre counts, especially when it provides a natural oasis in an area as densely populated as Camden County, New Jersey. On the south side of Laurel Springs sits Laurel Lake, which serves as the scenic backdrop to this natural area and was considered by Whitman to be the “most beautiful lake in North America.” Take a walk here and immerse yourself in the green embrace of woodland understory, towering trees, chirping birds and delicate wildflowers, and you’ll understand why so many have sought out this peaceful remnant of Whitman’s day. In fact, Ellen Kuehner notes that, “Every time I’m here, I see people walking, writing or even painting.” Occasionally, she encounters brides and their photographers; more often she sees children fishing for sunnies, just as she did decades ago. In addition to attracting humans, the lake site serves as an ideal foraging spot for a variety of wildlife, including bald eagles, hawks, wild turkey, painted turtles, white-tailed deer and Eastern cottontails. Lifelong “Springer” Lloyd Shaw notes that, “The stately trees alone warrant protection, but I see the barred owl here, and red-shouldered hawks, both endangered in New Jersey. Pockets of habitat like this ‘green island’ are integral to wildlife for survival.” Shaw is a New Jersey Audubon and Cape May Bird Observatory field guide who has been documenting the site’s native flora and fauna for decades. The Kuehner family has long recognized the area’s need for open space and passive recreation, and passionately prefers conservation over the prospect of development (the family homestead was razed in 1973). Prior to her mother’s death in 2009, Elizabeth was entrusted with ensuring the land would be conserved and has explored various options since 2010. In 2012, she formed the “Whitman Woods” Project (WWP) Advisory Board and serves as project manager. Both Lloyd Shaw and Joseph Arsenault sit on the WWP Board, along with a number of kindred spirits from all walks of life. The vision for a nature sanctuary was recently realized in a site plan, thanks to a collaboration with key advisors. It calls for the transformation of the driveway and foundation ruins into a wheelchair accessible ramp and lake overlook, expansion of existing trails, the addition of a pebble beach canoe landing and the creation of rain gardens to mitigate polluting runoff into the lake. Two kiosks will welcome and orient visitors, while a split-rail fence will define the park. The sisters hope that the wild character of the woods and glen can be preserved for nature walks, poetry readings and workshops, nature seminars and painting and photography classes. To preserve the woods in perpetuity is a goal shared by many “Springers” and countless others, including Whitman scholars. This future, however, is not yet certain. Protecting “Whitman Woods” from development is not an undertaking that the WWP Advisory Board and NALT can accomplish alone. And while Laurel Springs Borough officials are supportive of the cause, neither they nor Camden County are in a position to purchase or manage this intended conservation area. To date, nearly $150,000 in services, pledges and donations have been made to the project. In order for NALT to purchase, transform, manage and steward the park, an additional $1 million is required. May 31, 2019 marks the 200th anniversary of Walt Whitman’s birth. Raising funds to establish the park well in advance of that date is critical if it is to be dedicated as part of the bicentennial festivities. 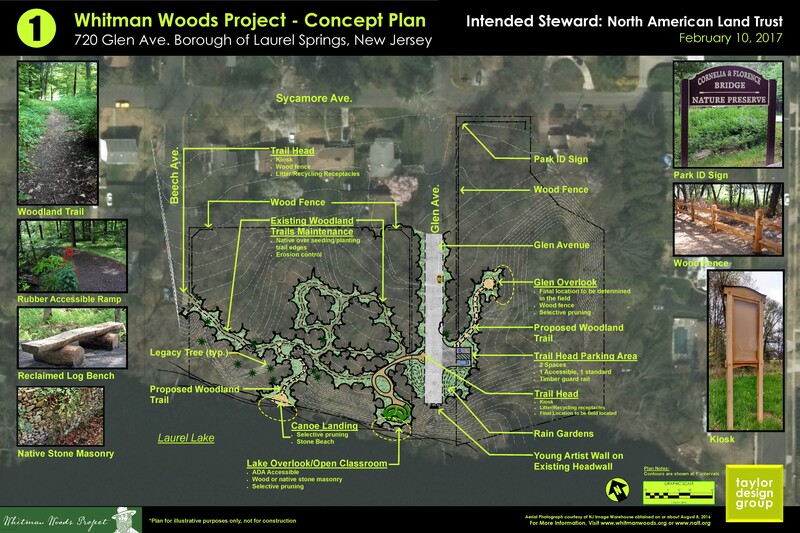 We are calling on you to propel “Whitman Woods” from vision to reality! Your generosity will help conserve this precious piece of land, an enduring place that has instilled countless memories and wonderment upon visitors—from poets and birders to curious children drawn to nature. Thanks to your past donations, NALT has permanently protected more than 100,000 acres across the U.S., and now the ability to conserve and care for “Whitman Woods” rests in your hands. Ensuring that present and future generations can continue to escape into the natural beauty of this sacred spot is a necessity. You can support “Whitman Woods” by downloading and completing the “Whitman Woods” Pledge Agreement, or donating online directly to NALT. Be sure to visit the “Whitman Woods” website to learn more!